So I’m sitting in front of my computer, mindlessly going through my Facebook feeds, emails, reading blogs, all the while sniffling, sneezing, blowing my nose and generally feeling miserable, when a friend posts a beautiful poem that simply goes right to my core. 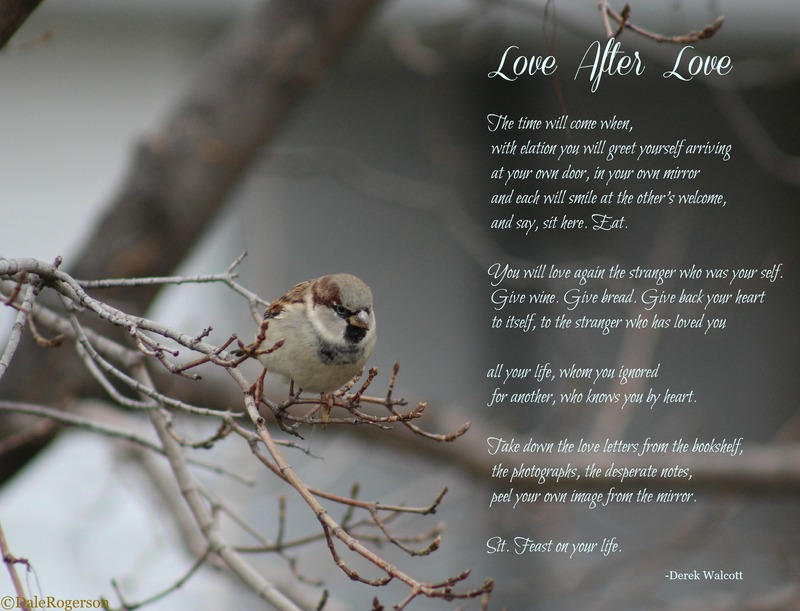 Thank you, Sonia, for sharing this lovely poem! This entry was posted in Friends, Gratitude, Love, Poetry, Well-being and tagged Derek Walcott, Love After Love, poetry. Bookmark the permalink. Well my goodness, that’s lovely! And lovely bird shot as well! So this was one of those moments that came unexpectedly to hit you like a ton of bricks … and that’s expected, thus OK. Keep smiling! Thanks Andrea! Feeling a smidge better at best! LOL! With the comment section in WP, they all jumble together…so I actually assumed it was this one! Dale, hope you get rid of those ‘sniffles’ pronto. Love the Derek Walcott poem ~ love ALL Derek Walcott poems. Great idea to match it up with the photo. Strange, I always think, how photos have a way of pressing themselves forward and refusing to be ignored! I’m much better this morning. Yes, he was a wonderful discovery to me! Some photos do indeed! Funny how that happens, eh Vivi? I just love how what you need comes when you need it!